There was no such thing as online video advertising (or even “online,” really) back when Loverboy first sang about working for the weekend, but weekends do in fact offer the best bang for the buck if you’re buying online video ads. The U.S. edition of Brightcove technology partner TubeMogul’s new “State of Real-Time Video Advertising” quarterly report reveals that weekends boast 29.6% of the week’s video viewing, yet have the lowest prevailing CPMs at $8.67. Apparently not everybody is working for the weekend according to TubeMogul’s David Burch, who told TechCrunch that the trend is likely due to the fact that media buyers aren’t at their trading desks on weekends. 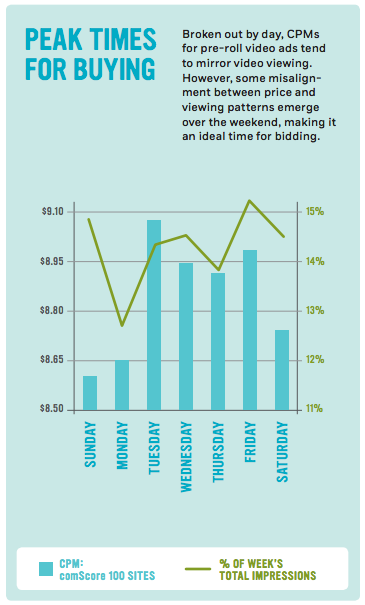 The graph below illustrates CPMs for pre-roll ads by day. Ad size and length impact completion rates: Larger (more than 1000 pixels), longer (30 seconds) ads showed higher completion rates than smaller (less than 1000 pixels), shorter (15 seconds) ads. Breaking it down further, larger ads performed better than smaller ones, whether they were 15- or 30-seconds long. Prices are growing steadily: Pre-roll video ad CPMs grew at 2.5% during the first half of 2012 with a peak of $9.93 in June. CTRs vary widely: Click-through rate trends were fairly inconsistent. In fact, TubeMogul’s tier 3 & 4 quality sites demonstrated some of the highest CTRs for 15-second pre-rolls. “They’re all over the place,” Burch told TechCrunch. Online video advertising presents a great opportunity for publishers of all sizes to take advantage of the fastest growing segment of online advertising. The key is a well-defined audience and good content.